Founded by botanist, explorer and plant collector John Bartram, the 46-acre estate is bordered along the lower Schuylkill River. Sometimes referred to as the father of mail order gardening, Bartram collected, cultivated and sold seeds and plant specimens. The result being the most varied collection of North American plants in the world. Bartram is credited with saving the Franklin tree from extinction; all current Franklinia are descended from those grown by the Bartrams. Tour Bartram’s home, the historic vegetable, flower and herb gardens; be sure to explore paths through tidal wetlands and discover the old cider press down by the river. These gardens were designed by the Olmsted brothers, descendants of one of the architects of New York’s Central Park. Designed over 100 years ago, this garden has spectacular views of Puget Sound and beautiful woodland walks. Explore this beautiful dose of nature in the city. The 24-room home of Robert Todd Lincoln (the first son of president Abraham Lincoln) includes formal garden plantings; the over 1,000 peonies blossom from plants that date back to 1907. Robert Todd Lincoln was the Chairman of the Pullman Company. Tour the Cutting & Kitchen Gardens, walk the paths and admire the arbors. Explore the 12 miles of walking trails including the Farm Loop Trail. See the 1,000-pipe organ in the entrance hall, a 1903 Pullman car, or admire the 1928 Franklin Roadster that once belonged to a Lincoln family member. Gardening was in the lineage of Pierre S. du Pont whose grand country estate and garden became Longwood Gardens. The original 200 acre estate began with a 600 ft. long flower garden back in 1907; it evolved into 1,077 acres of lavish gardens, fountains and conservatories. It is truly one of the world’s premier horticultural display gardens. Known as America’s oldest landscape gardens, this 18th century estate includes gorgeous sculptures, walkways and galleries. Created by Henry Middleton, planter and former president of the Continental Congress from South Caronlina, the 65 acre estate is located along the banks of the Ashley River. For a step back in time, tour the home, the gardens with centuries old flowering trees, and the stableyards. 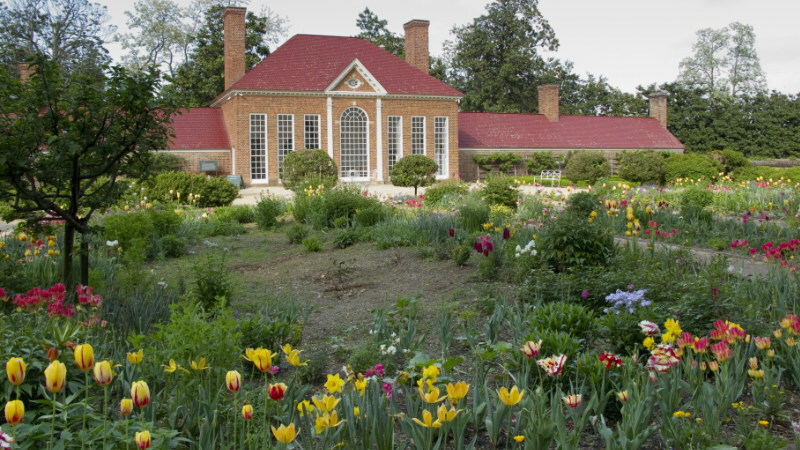 Visit the gardens and home of the revolutionary gardener Thomas Jefferson. The author of the Declaration of Independence grew 330 vegetable varieties in the 1,000 ft. long terraced garden which covers roughly 2 acres alone. Tour the gardens which recreate the growing and cultivation practices popular in the 19th century. Walk along the West Lawn garden which abounds with flower borders. Tour the fruit gardens and the vineyards. 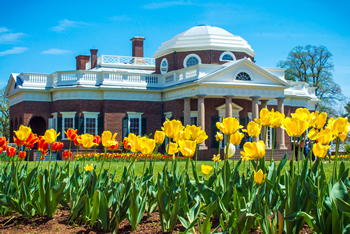 While there, also tour Jefferson’s Monticello home. With over 5,000 acres, there’s much to see at Monticello. George Washington’s estate overlooks the banks of the Potomac river, which today encompasses 500 preserved acres. The historic gardens include Martha Washington’s kitchen garden, formal gardens and greenhouse, fruit trees (including cherry trees of course), and a botanical garden used for plant experimentation. Also tour the 21-room mansion, the tombs of George and Martha Washington, historic outbuildings, and the nearby distillery and gristmill. Can you imagine what the creators of all these beautiful gardens might have done if they had a Mantis Tiller? What historic American gardens have you been to? We’d love to hear from you!